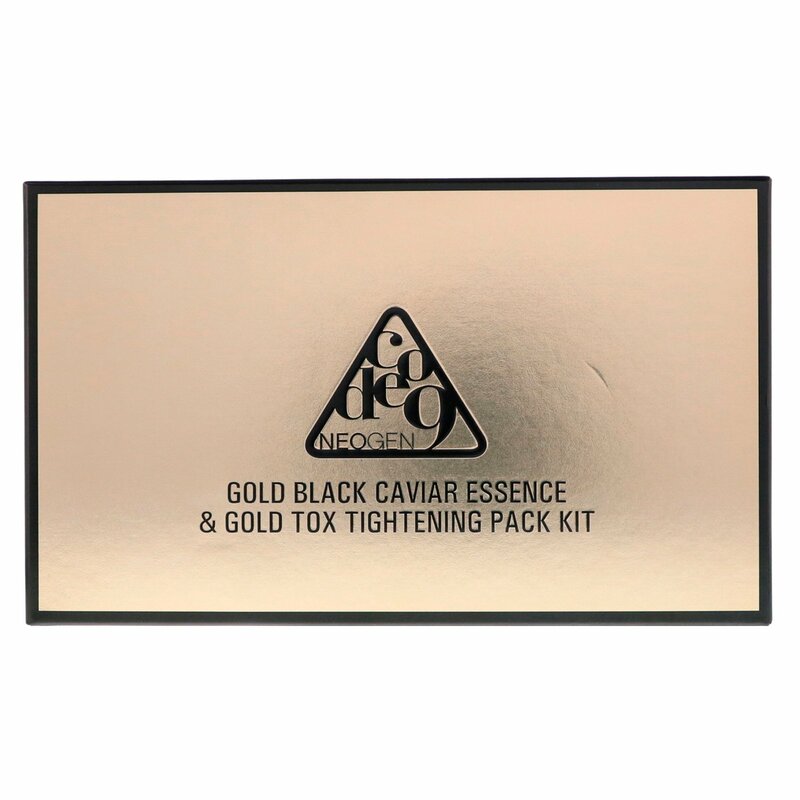 Neogen Code 9 Gold Black Caviar Essence & Tox Tightening Pack Kit is a highly concentrated total care essence formulated with gold, caviar, super black complex and various naturally-derived and naturally-extracted low-temperature ripened ingredients. 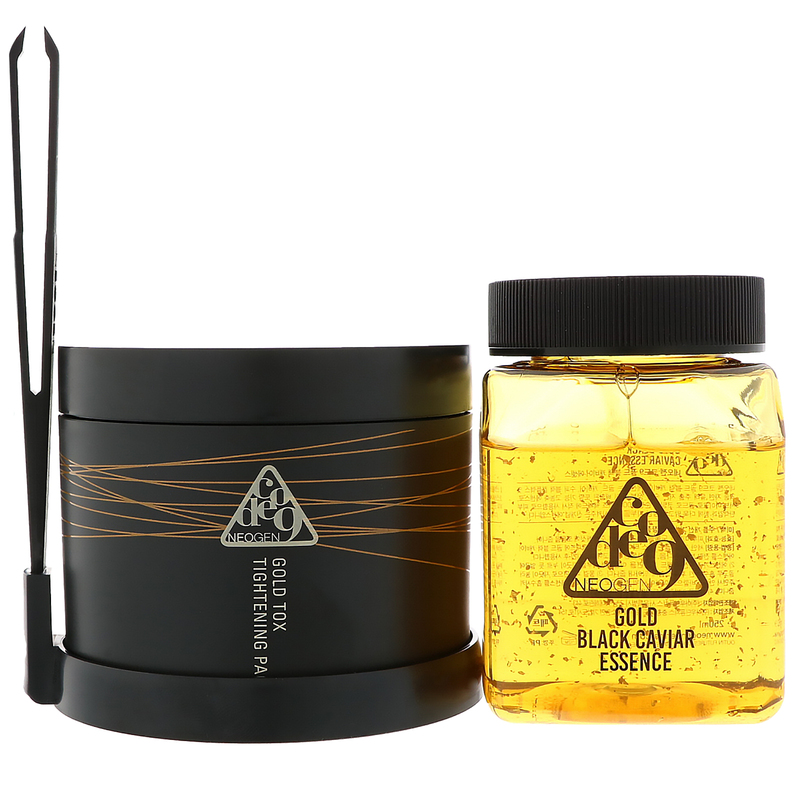 It is a new type of skin care you use with 100% cotton pack pads coated with sub micro gold to reinforce skin elasticity and to give face brighter, silkier and plumper complexion. Saturate pack pads with the whole bottle of gold black caviar essence and keep them in refrigerator for 9 hours. After cleansing, apply one pack pad to face with gentle pressure and sweep over face. Then use the other side, ripple pad to help essence penetrate by smoothing over face from the inside and sweep outward, and then from the bottom upward motion. Finish with gentle patting. * Use within 2 months. 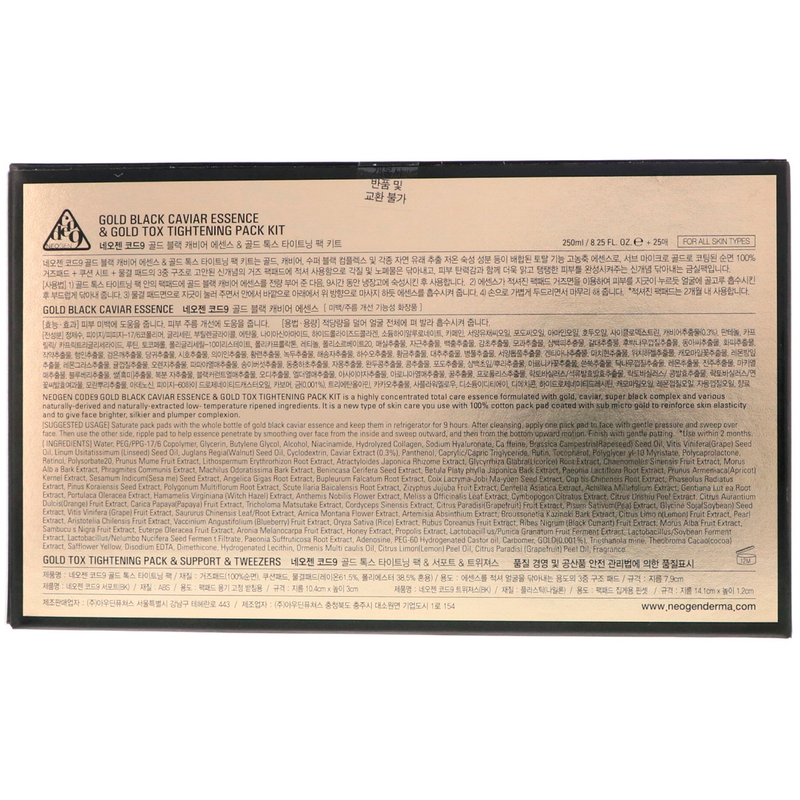 Water, peg/ppg-17/6 copolymer, glycerin, butylene glycol, alcohol, niacinamide, hydrolyzed collagen, sodium hyaluronate, caffeine, brassica campestris (rapeseed) seed oil, vitis vinifera (grape) seed oil, linum usitatissimum (linseed) seed oil, juglans regia (walnut) seed oil, cyclodextrin, caviar extract (0.3%), panthenol, caprylic/capric triglycerides, rutin, tocopherol, polyglyceryl-10 myristate, polycaprolactone, retinol, polysorbate 20, prunus mume fruit extract, lithospermum erythrorhizon root extract, atractyloides japonica rhizome extract, glycyrrhiza glabra (licorice) root extract, chaenomeles sinensis fruit extract, morus alba bark extract, phragmites communis extract, machilus odoratissima bark extract, benincasa cerifera seed extract, betula platyphylla japonica bark extract, paeonia lactiflora root extract, prunus armeniaca (apricot) kernel extract, sesamum indicum (sesame) seed extract, angelica gigas root extract, bupleurum falcatum root extract, coix lacryma-jobi ma-yuen seed extract, coptis chinensis root extract, phaseolus radiatus extract, pinus koraiensis seed extract, polygonum multiflorum root extract, scutellaria baicalensis root extract, zizyphus jujuba fruit extract, centella asiatica extract, achillea millefolium extract, gentiana lutea root extract, portulaca oleracea extract, hamamelis virginiana (witch hazel) extract, anthemis nobilis flower extract, melissa officinalis leaf extract, cymbopogon citratus extract, citrus unshiu peel extract, citrus aurantium dulcis (orange) fruit extract, carica papaya (papaya) fruit extract, tricholoma matsutake extract, cordyceps sinensis extract, citrus paradisi (grapefruit) fruit extract, pisum sativum (pea) extract, glycine soja (soybean) seed extract, vitis vinifera (grape) fruit extract, saururus chinensis leaf/root extract, arnica montana flower extract, artemisia absinthium extract, broussonetia kazinoki bark extract, citrus limon (lemon) fruit extract, pearl extract, aristotelia chilensis fruit extract, vaccinium angustifolium (blueberry) fruit extract, oryza sativa (rice) extract, rubus coreanus fruit extract, ribes nigrum (black currant) fruit extract, morus alba fruit extract, sambucus nigra fruit extract, euterpe oleracea fruit extract, aronia melanocarpa fruit extract, honey extract, propolis extract, lactobacillus/punica granatum fruit ferment extract, lactobacillus/soybean ferment extract, lactobacillus/nelumbo nucifera seed ferment filtrate, paeonia suffruticosa root extract, adenosine, peg-60 hydrogenated castor oil, carbomer, gold (0.001%), triethanolamine, theobroma cacao (cocoa) extract, safflower yellow, disodium EDTA, dimethicone, hydeogenated lecithin, ormenis multicaulis oil, citrus limon (lemon) peel oil, citrus paradisi (grapefruit) peel oil, fragrance. For external use only. When using this product, keep out of eyes. Rinse with water to remove. Stop use and ask a doctor if rash or irritation develops or lasts. Keep out of reach of children. If swallowed, give fluids liberally and get medical help or contact a Poison Control Center right away.